Your dad probably fished with a Pflueger Reel and so dis his father. Time to carry on a fishing legacy that has been around since 1881. Pflueger Reels have been around since the dinosaurs, and since then they have delivered legendary fly fishing products that have always been durable and dependable. You know that when you purchase a Pflueger reel, you are obtaining a product from a company who has been committed to craftsmanship and fly-fishing excellence for the past 120 years, and that's something that only a few can still say in this day and age. 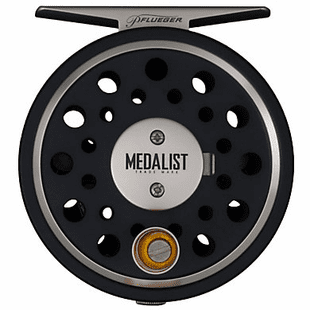 They continue their tradition in fly-fishing with the updated Pflueger Medalist; a reel that maintains its classic feel while including new components and current materials. It has an updated click & pawl system and it�s built with modern materials. See more details about this reel below.